Peter Tsouprake was born on February 4, 1928. He enlisted in the U.S. Army Air Forces on December 27, 1945, and served as a Weather Forecaster before leaving active duty on November 15, 1948. Peter then attended Brown University, and was commissioned a 2d Lt in the U.S. Air Force through the school's Air Force ROTC program on August 25, 1952, going on active duty beginning September 16, 1952. After attending Electronic Countermeasures (ECM) training and B-36 Peacemaker Combat Crew Training, Lt Tsouprake served as a B-36 ECM officer at Spokane AFB, Washington, from May 1954 until attending B-52 Stratofortress transition training from January to March 1956. His next assignment was as a B-52 ECM officer with the 330th Bomb Squadron of the 93rd Bomb Wing at Castle AFB, California, from June 1956 to January 1957, followed by service as a B-52 ECM officer with the 326th Bomb Squadron of the 92nd Bomb Wing at Fairchild AFB, Washington, and then at Glasgow AFB, Montana, from February 1957 to August 1962. 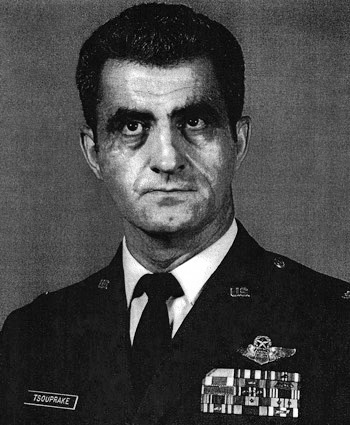 Capt Tsouprake served as an ECM instructor with the 3537th Electronic Warfare Training Squadron at Mather AFB, California, from August 1962 to March 1966, and then attended F-105 Thunderchief Wild Weasel training from March to May 1966. 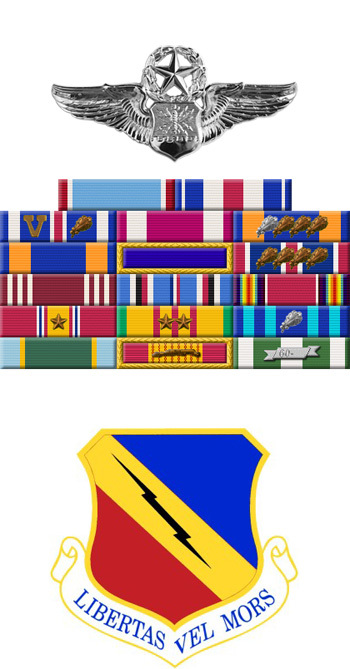 His next assignment was as an F-105 Electronic Warfare Officer (EWO) with Detachment 1 of the 388th Tactical Fighter Wing at Korat Royal Thai AFB, Thailand, from May 1966 to January 1967, followed by service as a Wild Weasel Electronic Warfare Instructor with the 4537th Fighter Weapons Squadron at Nellis AFB, Nevada, from January to July 1967. He served as the Electronic Warfare Test Manager with the U.S. Air Force Tactical Fighter Weapons Center at Nellis from July 1967 to April 1970, and then as a staff officer with Headquarters U.S. Air Force in the Pentagon from April 1970 to January 1973. His next assignment was as the Senior Electronic Warfare Officer, Communications and Electronics Division with NATO at Brussels, Belgium, from January 1973 to August 1975. His final assignment was with Research and Development at Hanscom AFB, Massachusetts, where he retired from the Air Force on July 1, 1978. Major Peter Tsouprake distinguished himself by extraordinary heroism in connection with military operations against an opposing armed force near Hanoi, North Vietnam, on 5 July 1966. On that date, Major Tsouprake, an F-105F Electronics Warfare Officer in the lead aircraft of a flight tasked to support a large strike force, detected hostile surface-to-air missile sites which threatened the other strike force. With complete disregard for his personal safety, Major Tsouprake responded professionally in the face of continuous heavy and intense ground fire of all types and directed his pilot in attacks against four separate missile complexes. Three of the four sites were completely destroyed, and the remaining site sustained extensive damage. This courageous and aggressive action considerably reduced the missile threat against the other strike force. Through his extraordinary heroism, superb airmanship, and aggressiveness in the face of hostile forces, Major Tsouprake has reflected the highest credit upon himself and the United States Air Force.